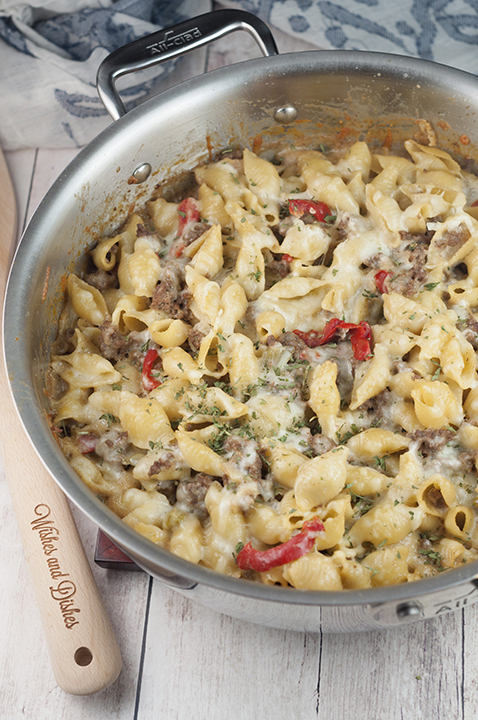 This easy dinner recipe for Philly Cheesesteak Pasta is a cheesy comfort food dish that will become a new family favorite! If you thought my Philly Cheesesteak Baked Egg Rolls were good, you are in for a treat today. So, things have been a little bit crazy around here. Time is flying by with a newborn baby and I can’t believe it’s August already! I have to admit that I haven’t been cooking a lot lately. Mr. Wishes has been saving our dinners with grilling out – I guess that’s a perk to having a new baby in the summer! 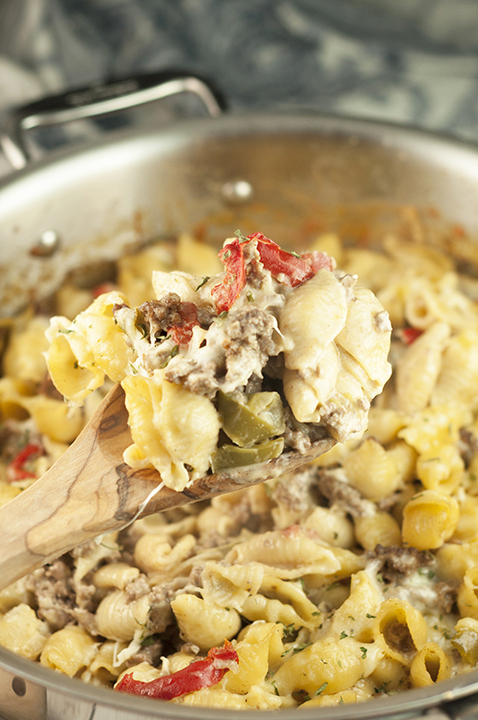 This Philly Cheesesteak Pasta is one those meals I dream of having again soon. My poor baby Eliza got diagnosed with a dairy allergy a couple of weeks ago so I won’t be enjoying this Philly cheesesteak pasta anytime soon, but I can guarantee it will be one of the first meals I make when she outgrows the allergy, along with my Sloppy Joe Macaroni and Cheese! A meal loaded with pasta and cheese is the greatest that it gets. A cheesesteak, also known as a Philadelphia cheesesteak, Philly cheesesteak, cheesesteak sandwich, cheese steak, or steak and cheese, is a sandwich made from thinly sliced pieces of beefsteak and melted cheese in a long hoagie roll. I have made Philly Cheesesteak Dip in the past When I saw it in pasta form I had to make it! I first saw this meal on my friend Lisa’s Instagram page (Wine and Glue blog). I immediately took a screenshot of it so that I remembered to make it. I rarely see a photo of food and immediately think to myself that I NEED to make it ASAP but it definitely happened. It took me about two days to go to the store to get the ingredients to make it. It did not disappoint, let me tell you! I mean, just looking at the photos makes it obvious that is one is going to be a keeper for years to come. I also have my eye on this Philly Cheese Steak Hasselback Chicken from my friend Amy. Delicious! If you’re into the cheesy pasta dishes that only use ONE pot, this One Pot Chili Mac and Cheese is one that has made it to the top of my list. 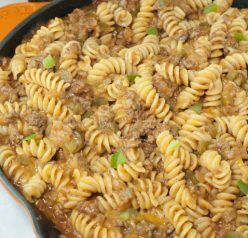 Also, if you haven’t had my Homemade Hamburger Helper, it’s time to change that. 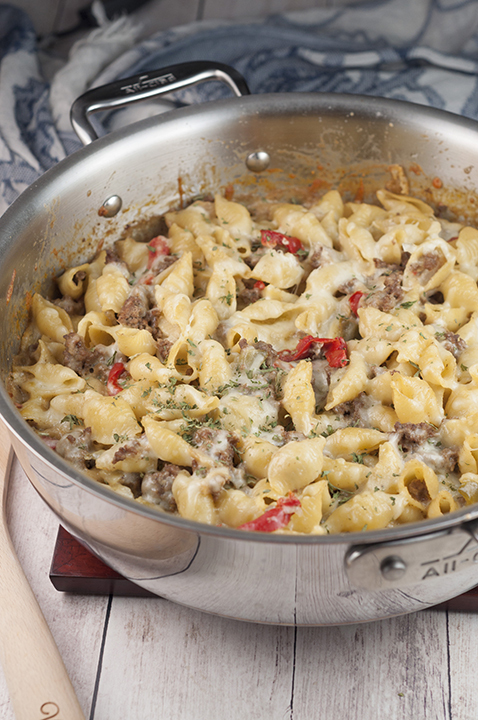 Check out my how-to video of me making the recipe for this Philly Cheesesteak Pasta! Combine the beef stock with 32 ounces of water and cook the shells in a large pot to al dente in this liquid. Drain noodles, save ½ cup of liquid. Melt the butter in skillet, cook the garlic clove for thirty seconds being careful not to let it burn, then add the bell pepper and onion and cook about 5 minute or until translucent. Add in the ground beef, season with salt and pepper, and cook until beef is no longer pink. Mix in the cream cheese until melted - a minute or two. Stir in the reserved cooking liquid from the noodles, pasta, and shredded mozzarella. Top with sliced provolone and pop in the oven to melt if your skillet is oven-proof. 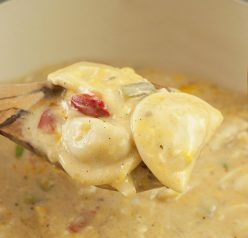 If your skillet is NOT oven-proof, transfer mixture to a large greased baking dish and topwith the provolone cheese. Bake for 20 to 25 minutes or until the provolone is completely melted. Enjoy! This looks great! The cheesier the better! What is the red in the picture? Tomato or red pepper? That is red pepper in the photo. Wow, this looks good! And very creative. Neat dish — bet it tastes wonderful. Thanks! This is a really creative pasta. Love the flavors! SO cheesy, we love fusion dishes! I love anything involving cheese steak ingredients! What a great dinner idea! Looks so mouthwatering. I’m afraid I would finish the whole bowl myself! 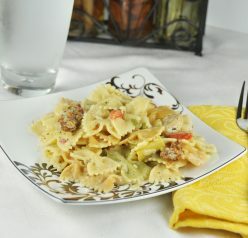 Loving this comfort food dinner recipe! This is so good! I added sliced mushrooms too. Thanks for the recipe. This was so good! The entire family loved it. Thanks for the recipe! Does the garlic get chopped up and added to the mixture? Or do are we only using the garlic to make the butter taste like garlic? You don’t drain the hamburger grease? I use super lean beef but if you don’t then definitely drain it! Have you ever made this and froze it? Thinking about making it for a friend that just had a baby. Thanks! I would also like to know if this freezes well! I sprinkled some parsley on the top at the end just for some color for the photo! Good eye!